Roses are definitely a ‘you can’t go wrong’ gift for girls. Where they rank in the hierarchy to chocolates and diamonds is purely an individual choice I believe. But one thing for sure is any girl would love to have roses on the table and diamonds on the neck. It is almost like I am doing a series on Roses because my previous post was Rose swirl cake. 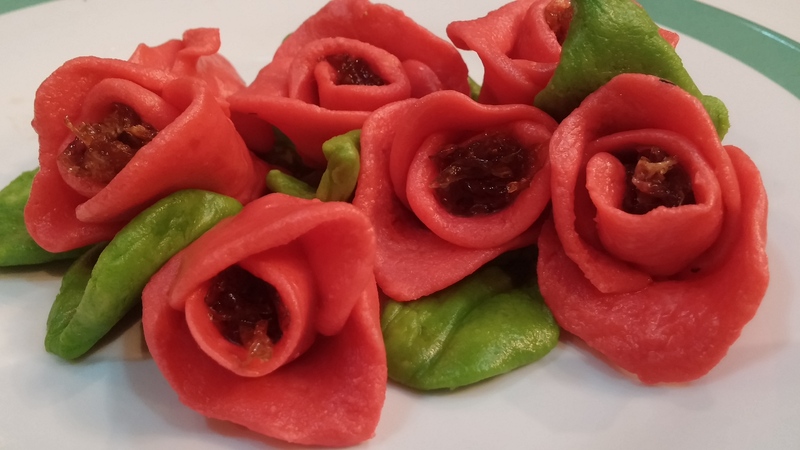 But this recipe is something worth a try.Each rose has a sweet filling called Gulkhand. 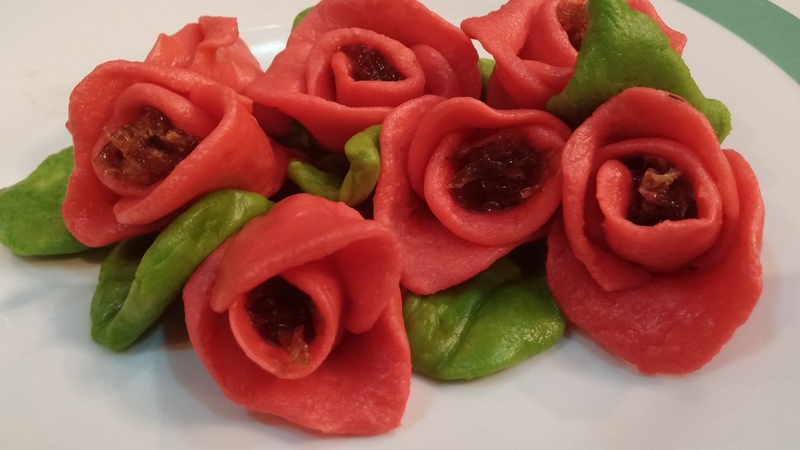 It is a rose petal preserve which you can find easily at Persian or Indian stores. You can make Gulkhand easily at home too. 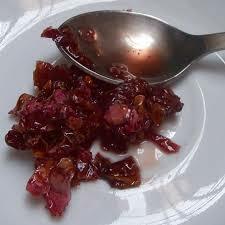 I am adding the recipe for making the rose preserve at home, though I used the store bought one. In a microwave safe bowl, add the condensed milk, milk powder and butter. Microwave for one minute and stir well. Microwave again for one minute. Add the essence and mix well. Divide the dough into 2/3 and 1/3 portions. 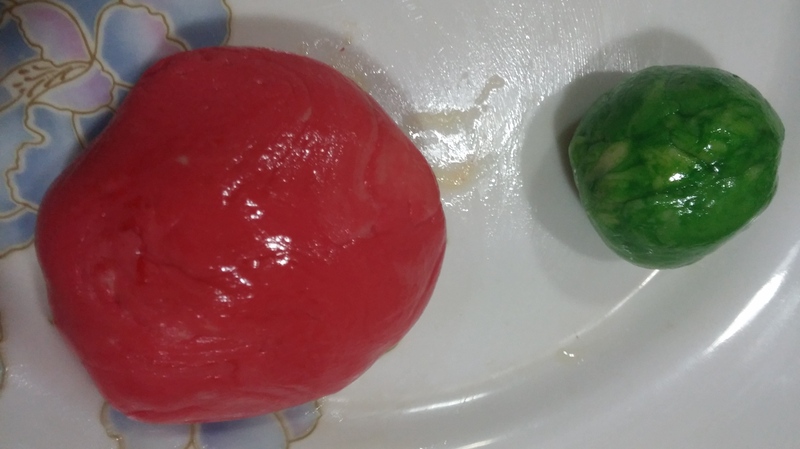 Add red to the 2/3 and green color to the 1/3 parts of dough and knead well. Grease your fingers with butter. 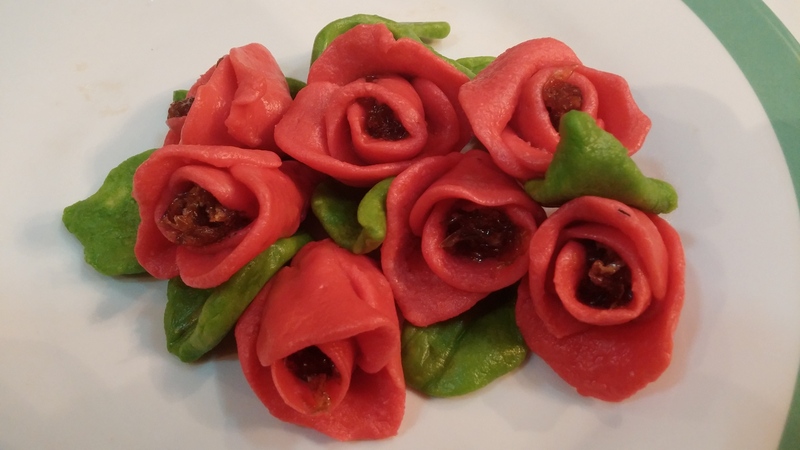 Make rose petals with the red dough and leaves with the green one. Take one petal. Put 1/2 a teaspoon of Rose preserve/jam/gulkhand on the center and twist it like a bud. Work around this bud, adding one petal after another till a rose is formed. Fix stems and leaves to your rose and arrange on a plate. If you are giving it away, you can place them on a beautiful vase or make a bouquet. The Damascus rose is usually used. But you can use any edible Rose. Wash and clean the rose petals. Take sugar weighing the same amount as the rose petals. Take a glass preserve jar and a white cloth to cover it. Put a layer of roses in the jar. And cover it with a layer of sugar. Alternate these layers until all the petals have been used up. Cover with the cloth and tie with a thread to fix it. Leave in sunlight for 10 days. Your rose preserve is ready to use. I am taking my bouquet to FF45 the most happening party in town. The ever so graceful host Angie is co hosting this with two lovely ladies Michelle @Giraffes Can Bake and MB @Bourbon & Brown Sugar . Come join me at The Novice Gardener’s…. Wow those are gorgeous, I am fascinated by the dough. Really well done and delicious. Thank you Suzanne 🙂 The dough was really pliable and easy to use. Your roses look lovely! Thank you so much for acknowledging my blog. I really appreciate it! These are too beautiful to be eaten. Great job. I look forward to your new versions too! You have an awesome blog! Oh my word… what a fascinating idea… your roses are wonderful! I’ve never seen anything quite like them. Thanks so much for bringing them to Fiesta Friday! Just beautiful! I think they would display nicely on top of a cake. They are so pretty though I might just keep them instead of eat them! Better make extra. 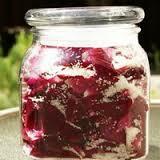 Can I use preserved/ candied rose petals? Like the one sold in supermarkets? Ahhh… I get it now! I love these!! 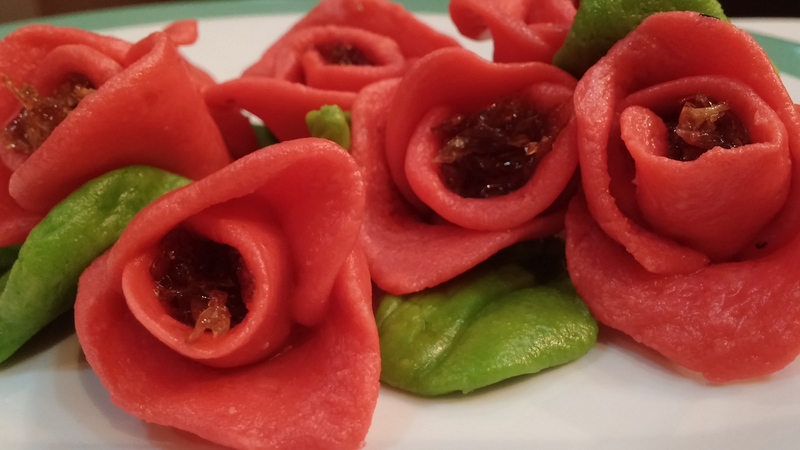 I’ve made my fair share of sugarpaste roses and while they look pretty, they’re not great to eat. This is the best of both worlds!